Lee's Summit Superintendent Dennis Carpenter, left, was a panelist at an educational equity forum Thursday night in South Kansas City. Gaps in achievement between white students and black students on state tests existed at every grade and in every content area. Black students represented 12 percent of the district’s population but 18 percent of the students qualifying for special education and just 2 percent of students identified as gifted. Only 55 percent of black students passed the algebra end-of-course assessment, compared to more than 80 percent of white students. White high school juniors who took the ACT received an average composite score of 22, nearly five points higher than their black peers. Even when the district controlled for poverty, these differences persisted – among students who received free or reduced price lunch, poor white students still outperformed poor black students. Carpenter, the district’s first black superintendent, has upset some parents with his frequent comments about educational equity. That hasn’t stopped him from talking about it. 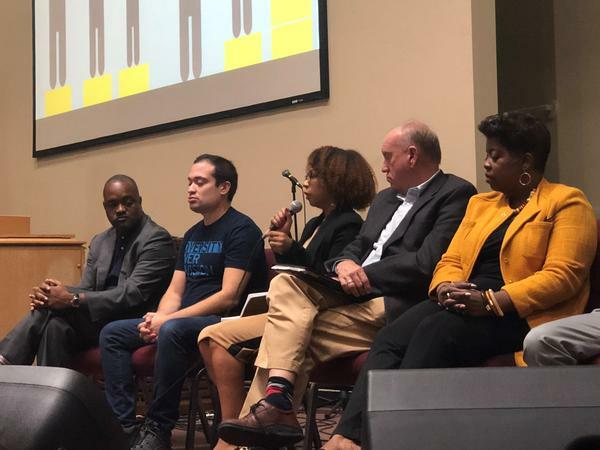 “Equity is the notion that talent is distributed equally across all populations, but oftentimes access and opportunity are not,” Carpenter said Thursday night at an education forum in South Kansas City attended by some Lee’s Summit parents. Another panelist, educational psychologist Melissa P. Hazley, explained that equity wasn’t Oprah handing everyone in the audience the keys to a new car. Hazley’s example got at the tension that Lee’s Summit is grappling with – whether resources will be diverted away from the district’s high achieving students and limit their potential. Carpenter seized on the car analogy at once. Inequity, he said, could be inadvertently written into well-intentioned policies, such as requiring a student provide their own transportation to an afterschool enrichment activity.